Audit records from an Oracle Solaris system can plug in to Oracle Audit Vault and Database Firewall, beginning with release 12.1.0.0. Oracle Audit Vault and Database Firewall automates the consolidation and monitoring of audit data from Oracle and non-Oracle databases. You can then use Oracle Audit Vault and Database Firewall for analysis and reports of audited events on Oracle Solaris systems. For more information, see Oracle Audit Vault and Database Firewall (http://www.oracle.com/technetwork/products/audit-vault/overview/index.html). 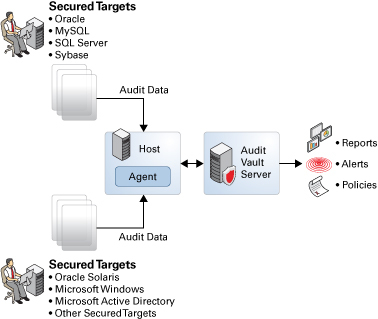 To configure Oracle Audit Vault and Database Firewall to accept audit records from both Oracle Solaris secured targets and non-Oracle Solaris secured targets, ensure that the agent is installed and activated on the designated host system. For more information, see the Oracle Audit Vault and Database Firewall documentation (http://www.oracle.com/technetwork/database/database-technologies/audit-vault-and-database-firewall/documentation/index.html).